Small cat breeds are perfect for individuals who have limited space or just enjoy felines with a kitten-like countenance. There are many small breeds to choose from, all with different personality types and a wide variety of colors. If you're looking for a cat breed that runs on the small side, you may find it difficult to select just one! When you are trying to narrow down your choice of small cat breeds for your family, knowing a few things about each breed can be helpful. The following chart covers some traits of particular concern to many potential cat owners. Each breed of small cat has interesting facts associated with it. The following will help you to get to know your favorite small cat breed better! Abyssinian - believed to have been the cat breed worshipped by Egyptians over 4,000 years ago. American Curl - first championship breed to have been accepted by the Cat Fanciers' Association that has two coat lengths- both short and long. Balinese - these cats are not from Bali, rather they are named for the Balinese dancer's graceful movements. 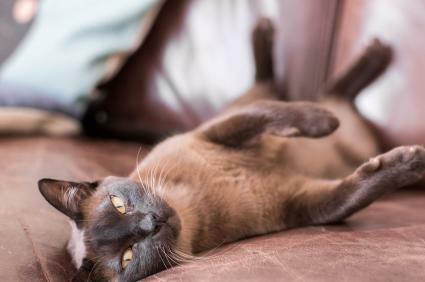 Burmese - playful and active cats, many members of this breed have been known to play fetch with their owners. Colorpoint Shorthair - also known as the Himalayan in Europe and in the Cat Fancier's Association the Pointed Pattern Persian. 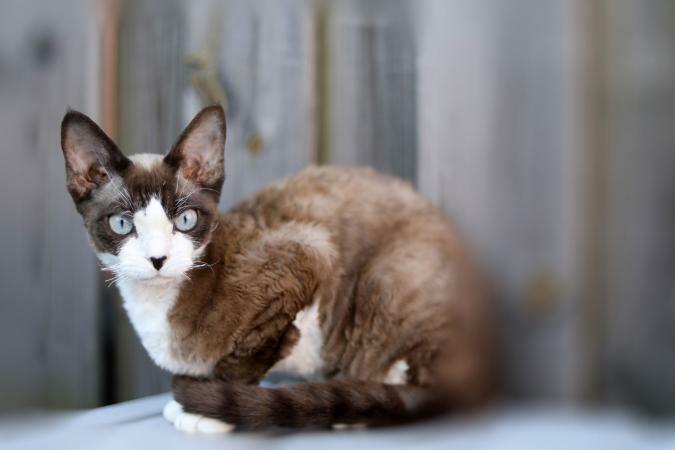 Cornish Rex - the first Cornish Rex was born in July 1950. This male cat's name was Kallibunker. Devon Rex - these cats wag their tails like dogs when they're happy. They are also known as "Purring Poodles." Dwelf - is a designer breed created by crossing Munchkin, Sphynx and American Curl cats. Japanese Bobtail - are much loved in Japan and are the inspiration for the "fortune cat" statues called Maneki-neko. Javanese - named after the island of Java. This breed is a cross of the Balinese and Colorpoint Shorthair. LaPerm - can be easily recognized by their curly coat, although not all LaPerm's will have this feature. Munchkin - the Munchkin's short legs are caused by a natural spontaneous mutation called hypochondroplasia. Nebelung - in German, this cat's name is translated as "creature of the mist." Oriental Longhair - even though this breed's name includes the definition "longhair," it is really a medium-haired breed. Oriental Shorthair - often referred to as "Ornamentals" because they come in over 300 color patterns. Peterbald - Peterbald cats are not born hairless. It takes up to two years for them to develop their famous, hairless bodies. Russian Blue - was once known as the Archangel Cat. It is believed that the cats originated in northern Russia and were transported to Europe through the port city of Arkhangelsk. Siamese - is one of the oldest cat breeds in the world, if not the oldest cat breed. Singapura - listed in the Guinness Book of World Records as the world's smallest domesticated cat. Somali - is the long-haired version of the Abyssinian cat. 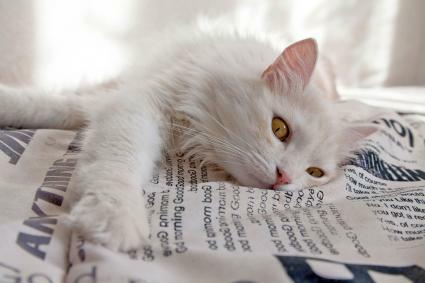 Turkish Angora - is an ancient breed that is known for loving to swim and will happily splash about in your pool or tub. Caring for a smaller size cat breed is not much different from caring for a medium-to-large size cat. There are a few safety precautions you should be aware of. The smaller your cat is, the easier it will be for him to hide in smaller areas. This can be a problem if your cat becomes trapped and cannot get out. Make sure that you go through your house and block off any small entrance areas to keep your cat safe such as open vents, empty boxes or areas behind appliances. Consider your cat's size when buying cat trees and window perches. Your smaller cat may not be able to jump as high as a moderate-sized cat. The first shelf on a cat tree should not be so high your cat cannot reach it from the ground. Make sure that your cat does not rough house with young children, larger cats or dogs. You do want to let everyone in the house have fun playing together, but supervise so you can step in if play gets too rough and your smaller cat is in danger of being unintentionally hurt. Smaller size cats can be an affectionate, beautiful addition to your life. They run the gamut from boisterous to quiet and come in all shapes and colors. Just make sure if you take one home that your house is "small cat proof" to keep them safe and happy.